Timothy Walsh's study of the function and significance of absence in literature demonstrates its centrality in terms of both literary technique and philosophical consequence. Textual gaps, narrative lacunae, and strategic vagueness, together with the uncertainties that such devices inevitably generate, have been essential elements of literature from Lao-Tzu to Lawrence, from Chaucer to Faulkner and beyond. Walsh finds that poststructural approaches to indeterminacy tend to overlook the specific and productive roles that absence and uncertainty often play within the overall design of a work. The aesthetic generation of uncertainty, he demonstrates, is not a roadblock on the path to meaning or a sign of some radical and suppressed internal contradiction; rather, it is as basic an artistic aim as the desire to evoke sympathy, laughter, or outrage. Coining the phrase ""structured absence"" to explain a central tenet in his discussion of the ""mechanics"" of uncertainty, Walsh analyzes various literary devices and tropes involved in generating a felt sense of absence and a purposeful uncertainty. Structured absences, he demonstrates, combine to form intricate patterns and networks, which explains how the dynamic potential of uncertainty can increase exponentially through a deft orchestration of absence. 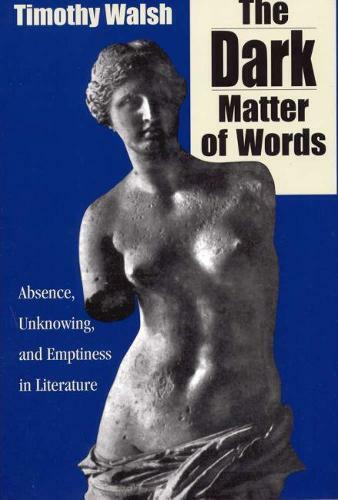 Walsh argues that the use of absence in works of art-of silence, shadow, blankness, and void-is a principal means by which the inherent biological limitations of human consciousness and of human language are encoded in aesthetic constructs. Because of the limitations of our senses and because we often are more attuned to what lies beyond the threshold of perceptual limits, the lacunae in artistic works represent attempts to replicate the real and inescapable limits of human experience. "To tackle the unknowable and the unsayable, and to succeed as Walsh has done, is to make a high contribution to the study of language and art." --Sandra Humble Johnson, author of "The Space Between: Literary Epiphany in the Work of Annie Dillard """
"To tackle the unknowable and the unsayable, and to succeed as Walsh has done, is to make a high contribution to the study of language and art." Sandra Humble Johnson, author of "The Space Between: Literary Epiphany in the Work of Annie Dillard """"